I came to rigid heddle weaving after weaving on 4- and 8-harness looms. So, lucky me, I already knew how to read a weaving draft (also sometimes called a pattern, though it's not a pattern in the sense of being a complete item being made, but a pattern of yarn interlacements on the loom). I could use that skill to figure out if I could apply it to my rigid heddle loom. This led to the posts about which patterns were usable on the rigid heddle loom. Which led the rigid-heddle-first weavers to ask, "how do you read a draft?" There are two (or possibly three) parts to that, though -- first, is understanding the parts of a weaving draft, and what makes it feasible to do on the rigid heddle loom as-it-stands. Second, is understanding how to apply it to a 2-heddle loom, as many (Schacht, Glimakra, Ashford Knitter's) can have second heddles. Third, would be the grand finale -- how to use pickup sticks to get more complex patterns. That, could be a fiber arts degree :) but I'll do my best to talk about recognizing what sorts of patterns are straight-forward to do on the rigid heddle loom - in part three. First, we have the harnesses. This section shows how to pull yarn through the harnesses on your loom -- the lowest row is the first harness ~ I've labelled it 1, the next is the second harness, and so on. 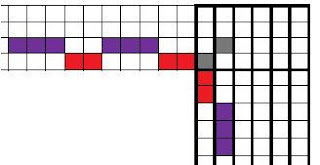 This diagram is for a four harness weaving draft, since there are four rows. Then, we have the tie-up. This is used for tieing up the harnesses to the levers on the loom. 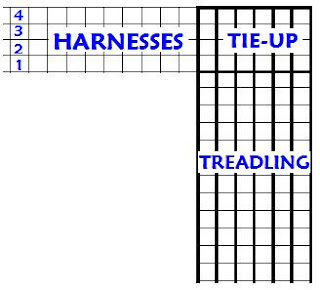 Now, most table looms have only direct tie-up, harness 1 to lever 1, harness 2 to lever 2, and so on. So, the tie-up in this case is an "abbreviation" to simplify presentation of the third part of the graph (the treadling, but let's not go there yet). On many floor looms, you can do tie-ups of multiple harnesses to one lever, so you'd tie up harnesses to levers to match the diagram. I'm going to completely gloss over Jack vs. Countermarch (or is it counterbalance?) looms, rising vs. sinking sheds, and all that stuff that still makes my eyes gloss over ... I promise to learn it someday, in the meantime see Leigh's Fiber Journal, she's talked about that before. Third, the treadling shows which lever to pull to execute the pattern of the weaving draft. This operates in conjunction with the tie-up. 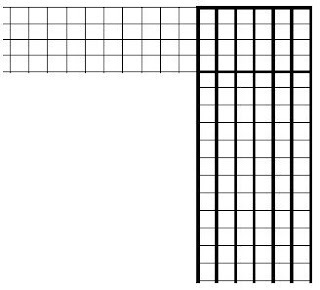 So, if you have "direct tie-up", harness 1 to lever 1, and so on, you'll have to lift all the levers selected in the first column when the first column's square is ticked in the graph. It's a combination of which harnesses the yarn goes through, and which ones are raised, that creates the marvelous patterns on the loom. Now, a rigid heddle is just that -- it's rigid. 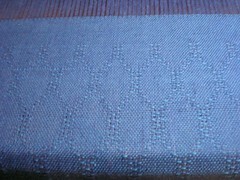 On a harness loom, the heddles move back and forth, spaced where you need them. This lets you do things like thread harness one multiple times in a row, then harness two, then three, then two again, then four, and so on -- getting quite inventive. There's a great writeup on IndieanaWeavers.org, Twills, Twills, Twills by Eleanor Best showing many interesting applications of that concept. So, how can you determine if a weaving draft can be done on the rigid heddle loom? The first kind that can, are 2-harness drafts. Those are the ones I listed from the books The Handweaver's Pattern Directory, Handwoven Scarves, and Color and Weave. Spotting a two harness draft can be as simple as making sure that only harness 1 and 2 have a check in them -- no yarns are put on harness 3 or 4 at all. That's the easiest. Shown here is a log cabin threading, tie-up, and treadling, that uses only the two harnesses so it's quite easy to see that it is a rigid heddle pattern. 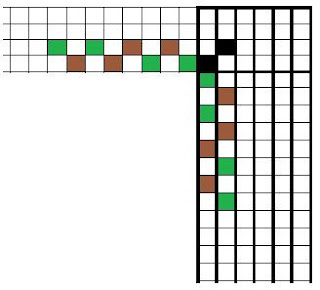 Sometimes, however, four harnesses will be used, but the tie-up will make the pattern a plain weave. The Handweaver's Pattern Directory did this a fair bit, actually, and I spotted a log cabin draft using four harnesses online here ~ so it's fairly common. A plain-weave tie-up puts the first and third strands on one lever, and the second and fourth strands on the other lever. The simplest case of this is shown here. There are more complex two-harness weaves than the simple plain-weave and its color and weave variations (log cabin, herringbone, plaid, and lots more). 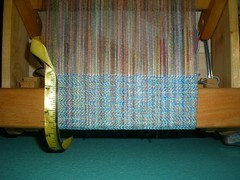 Hopsack (work on loom shown here) is one example. Its draft has threads repeating in harness 1 and harness 2, and also in the weft. This presents the challenge of deciding how to thread your fixed heddles. You can put 2 threads through a hole, and 3 through a slot -- but you'd want the right number of ends per inch as well, so you might end up with 2 through a hole, 2 through a slot, skip a hole, and 1 through the next slot to get the 2/3 pattern spread a little wider. This brings up the issue of "reed marks" ... the uneven distribution of yarns through the heddle can leave visible spacing in the final cloth. Sampling would be key, on the rigid heddle, to see if the marks are visible and unacceptable in your final fabric. A fabric that is loosely woven and then fulled, has the opportunity to move the yarns around and remove any reed marks from the as-woven fabric, or reduce their appearance. So adapting some weaving patterns to the rigid heddle -- those that aren't based in a plain weave pattern, but in repeating yarns in a harness -- should be done after sampling and fulling the sample to see how it does on your loom. Second, with hopsack, we have to deal with how to get two and then three weft shots through on the same heddle position. You could run 2 strands through at a time of one color, and 3 of the other, but they may bunch up and twirl around each other. The "big kids" technique of a floating selvedge can be handy -- an extra end-strand, run through a slot, that you always go around on each side of your fabric. This ensures that your strands will lay next to each other in the weaving, and not wind around each other, since you'd go across, wrap the selvedge, come back, wrap the selvedge, and then do the third pass, before changing the heddle for the other color. That's what we did with the hopsack fabric shown above. Once you've found a two harness draft, decide how to match the harnesses to your rigid heddle -- make harness 1 the holes and harness 2 the slots, throughout. Decide on the ends per inch for your yarn, and see if you will need to skip or repeat yarns in holes or slots to make the pattern match up to the harnesses in the draft. If the treadling repeats a given lever more than one time, you'll want to add floating selvedges to your warp as well. Armed with this tip-of-the-iceberg knowledge of weaving drafts and how to spot a 2-harness draft, then, you can tackle any pattern book to see which drafts require only 2 harnesses and thus, could be applied to the rigid heddle loom. Next up: identifying 3-harness patterns for the rigid heddle loom with two heddles. The first two woven fabrics are 8 harness patterns, with apologies to the rigid heddle weavers. However, that first one can actually be done on a rigid heddle loom -- David Xenakis has an article in The Best of Weaver's Series: Huck Lace called "Muck" which shows how to make complex huck lace patterns (that would require 12 harnesses or even more!!) on a rigid heddle loom. 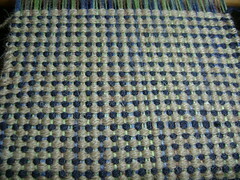 See the Weave topic for more articles on weaving. Part Two is now available, What can you weave with 2 heddles on the rigid heddle loom? I love the post Amelia. Very clear and easy to understand but I would like more information on how you do floating selvedges on the RH. Also David Xenakis has a whole book out on doing 4 harness weaves on a rigid heddle however his book and "Weaving With Three Rigid Heddles" by David McKinney (found on eBay) both require 3 heddles. Grin so there is another thing for you to cover. I do hope you are considering publishing a monograph out of all these wonderful rigid heddle loom posts. You are doing a lot of work and the results need a wider audience. Just my less-than-humble opinion (grin!). ah, floating selvedges ... I'll put them in the queue :) they're worth a picture-fest, that's for sure.